The preparation of a Parish Plan is a community initiative when all aspects of the village, its environs, and the life of its community is considered. The Plan should set out a vision for how the community wants to develop, and identify the action needed to achieve it. It can include everything that is relevant. Following two public meetings arranged by Radley Parish Council, a Parish Plan Steering Committee for Radley has been formed and a Parish Blog has been set up to keep people in touch – and for “feeds” click here. The main aim of the Steering Committee is to obtain the views of all members of the community (from the young people to the elderly) on how they wish the community to develop. It will be trying to join in activities of other village groups to obtain the views of their members, and it is hoped that some special events will be arranged throughout the coming months to obtain views of people who are not members of the various organisations. After the feedback from this communication has been analysed, a questionnaire will be prepared and circulated – to households or to individuals (this is something which has to be decided – so your views on this would be welcomed). The Steering Committee has met monthly, receiving advice from Mr Anton Nath, Oxfordshire Rural Community Council, on the way forward. From 21st September 2009, it will be meeting on the third Monday of each month, at 7 pm venue to be advised. Volunteers helped to delver the Questionnaire in March 2011. The completion response was better than expected. 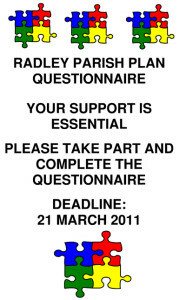 Radley Parishoners rose to the occasion to tell the Steering Committee how they felt about our Village. Click here for details of forthcoming Parish Plan Events.